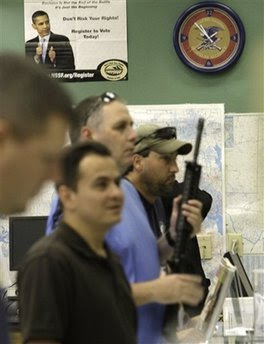 Due to unprecedented demand in firearms in 2009, Barack Obama was awarded the “Gun Salesman of the Year” by Outdoor Wire. Four years later Barack Obama continues to be a boon for gun sales. To the nation’s gun lobby and gun rights advocates, the Obama administration is public enemy No. 1. Yet the president has proven to be a boon for gun sales. In the four years since Barack Obama was first elected president in November 2008, an estimated 67 million firearms have been purchased in the United States. That’s more than were sold in almost seven years before his first election. Now come concerns that Obama will push through stricter gun laws — although in four years he’s yet to push for them. With Obama starting a second term in office — and anti-gun fervor stoked by shooting massacres in Aurora, Colo., and Newtown, Conn. — an unprecedented surge in the sales of firearms has taken off. December 2012 saw a record-shattering number of requests for criminal background checks on prospective gun buyers — more than 116,000 of those from Kansas and Missouri alone. Nationwide, more than 2.7 million of those checks were recorded for December, according to statistics kept by the FBI. Since late 1998 when federal law began mandating such checks for prospective gun buyers, the only other month that exceeded the 2 million mark was November 2012 — when Obama won a second term.